When you send your technicians out on a job, you want to be assured that you are equipping them with all the tools they need. That means making sure their trucks are not only stocked with needed parts and equipment, but that the technicians who man them have the information they need to get the job done. Scheduling is important when it comes to making a work schedule. You don’t want your technician driving all around town when the route could be optimized. If you don’t have time to optimize routes and prep your technicians, it’s time you got field service management scheduling software by Smart Service. Paper and pen is so last century. Details can get lost when switching between different interfaces. That means lost jobs, unhappy customers, and lost revenue. Instead, use Smart Service field service management software to step up your business. A live calendar shows you real-time status of your technicians. If a new job comes up, our software will tell you where you can place it according to optimized routes. Your technicians then get an alert notifying them of the new job! Booking becomes quick and easy. Double booking appointments can be a tragic result of scheduling. Thankfully, with field service management scheduling software, double booking isn’t possible. 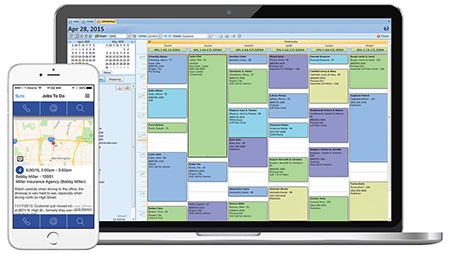 Our scheduling software tells you where you can book an appointment. Your technicians will be happier and your clients won’t be angry at a missed appointment. You don’t want to lose business due to a small clerical error. Smart Service field service management scheduling software solves this issue. Say no to double-bookings, scheduling errors, and unnecessary cancellations! Say yes to smart scheduling. Request a demo today and see how our field service management software will digitize, optimize, and grow your business! Manage, scheduling, equipment, and invoicing for your field service management business. Field service management made easy with the help of these articles!